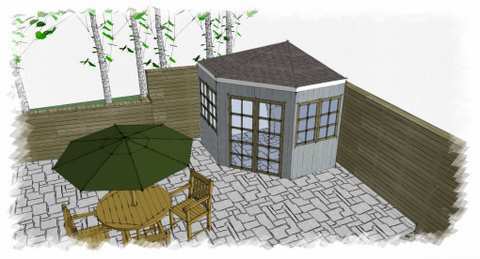 The Corner Garden Shed will save you space in the garden find out how to make the most of it. The corner garden shed is specifically designed for the space-challenged gardeners and hobbyists amongst us. As the population increases, the amount of land most of us have to live is accordingly eroded. You may not have a large garden, and wonder whether putting up a garden shed is worth your while. Done right a corner garden shed can be a functional yet aesthetically pleasing centerpiece of your little slice of landscape design. Size is one of the major factors to be considered when making a planning or purchasing decision. There are many styles available in stores, most in sizes ranging between 6'x6' and 8'x8'. When choosing which size of corner shed you want, think about what you are planning to store in the shed as well as how large your garden is. There is no point getting the smallest model and finding it impossible to work your way through to the back past the mass of equipment you've thrown in. Conversely you do not want the structure to stick out like a sore thumb or dominate the rest of the space. Tip: Training a vine, honeysuckle or other climbing plants is a great way to minimize the impact of any garden building. I would avoid ivy, the suckers it uses for climbing can damage the shed surface and it is so pervasive you may end up with as much in the shed as outside!! Obviously, one of the main advantages is that the basic shed model will generally cost you less than something larger. This is true whether you plan to buy your corner shed from a company or construct one yourself. The more artistically inclined you feel like being with the exterior of the structure the more it is likely to set you back. Of course, the extra effort can definitely be worth it - see the article on Japanese Garden Sheds for some inspiration! If you are a D.I.Y. enthusiast short on experience or free time, a corner garden shed may be the way to exercise your passion and get your feet wet while not committing to the time and money expenditure required to build a full-size shed. Keep in mind that the smaller nature of the typical corner garden shed can end up being a disadvantage in the long run. With a larger shed you have more scope to renovate the interior to suit your needs as they change in the future, perhaps to set up a home office or house a nearly independent teenager. With the limited amount of space granted by a corner shed this is not very practical. If you are looking for greater flexibility of purpose, check out the English Garden Shed or 10'x12' Garden Shed articles in this series to see if one of those might suit you better. But if you're looking for an efficient storage solution to fit in with either limited space or funding, a corner garden shed is the way to go.